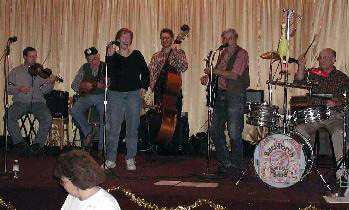 Music Styles Performed: Appalachian “old timey” tunes, Blues, Bluegrass, Waltzes, old Country, American Folk Songs, Western Swing, Square Dance Music. Other Comments: If you’re looking for a band with a swingin’ rhythm and an old timey flavor, look no further! This group combines the talents of six notable musicians responsible for the tapping of thousands of feet across Ohio for the last ten years. Included among the more than eighty-five performances they average each year, are county fairs, “Music on the Levee,” the Becky Thatcher at Marietta, Zanesville’s “Lorena” paddlewheel riverboat, Shaker Woods, Salt Fork Arts & Crafts Fest, Burr Oak and Malabar State Parks, Lowell Oktoberfest, the Moonshine Festival, Cincinnati’s Appalachian Fest, and countless square dances! So whether you’re looking for a family oriented variety act, a hot square dance band with a swinging rhythm that you can’t resist, or an historical anomaly that will knock your socks off, we suggest stepping out to The Back Porch Swing Band!